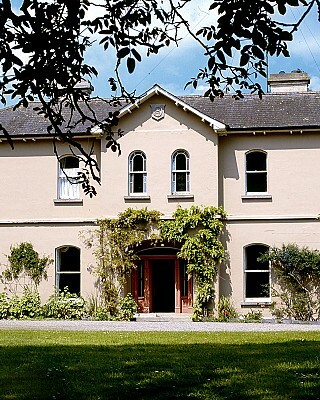 Rossnaree, B&B in Slane, Co. Meath near Newgrange. Rossnaree has a suitably imposing setting in the heart of Brú na Bóinne, overlooking the Boyne and the five thousand year-old passage tombs at Newgrange and Knowth. Rossnaree was built in the Italianate style during the Victorian era and has remained in the ownership of the Law family ever since. Its site is believed to be that of the House of Cletty, where the High Kings of Ireland, coming from nearby Tara, would partake in seasonal ceremonies. Aisling, the present owner, is warm, welcoming and a consummate hostess, with an interest in art and drama which is reflected in the art courses held at Rossnaree. Rossnaree (or ‘the headland of the kings’) stands high above the River Boyne in County Meath, slightly less than half way from Slane to Oldbridge, in an area long renowned in Irish history, heritage and folklore. In Celtic mythology, this is the place where Finn MacCumhail is said to have cooked the legendary Salmon of Knowledge and the present house is reputedly built on the site of the House of Cletty, where the High Kings on their way from Tara would wait before crossing the river to partake in the seasonal ceremonies and rituals. Brú na Bóinne, the three great burial mounds of Dowth, Knowth and Newgrange, which together make up one of the world’s most famous prehistoric burial grounds, is just across the river and there are particularly fine views of Newgrange from many of the rooms. Rossnaree has also been the site of some notable battles, including a hotly contested crossing of the river during the Battle of the Boyne in 1690. While parts of the house date from the early 1700s, Rossnaree was built by the Law family in the 1860s in the Italianate style. The main rooms are elegant and comfortable, in the traditional country house style, the decoration of some rooms also reflecting the owner’s many long sojourns overseas. It is surrounded by the family farm and bounded by the River Boyne, where there is private trout fishing in season. The present owner, Aisling Law, is a skilled cook and an accomplished hostess, and she and her children make guests very welcome. Rossnaree is right beside the Brú na Bóinne visitor centre, the access point for guided tours of the megalithic passage tombs at Newgrange and Knowth, and just off the M1, the main motorway from Dublin to Belfast, so that Dublin and its airport are within easy reach. In the immediate area is Slane Castle, famous for its rock concerts, the Hill of Tara, the three High Crosses at Monasterboice, Mellifont Abbey and the historic town of Drogheda. Groups and small functions welcome.